Pulmonary surfactant is a unique mixture of lipids and surfactant-specific proteins that covers the entire alveolar surface of the lungs. Surfactant is not restricted to the alveolar compartment; it also reaches terminal conducting airways and is present in upper airway secretions. While the role of surfactant in the alveolar compartment has been intensively elucidated both in health and disease states, the possible role of surfactant in the airways requires further research. 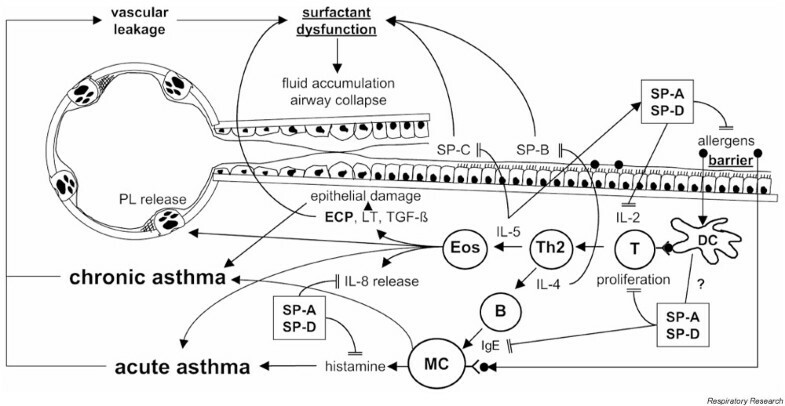 This review summarizes the current knowledge on surfactant functions regarding the airway compartment and highlights the impact of various surfactant components on allergic inflammation in asthma. Pulmonary surfactant reduces the surface tension at the air-liquid interface throughout the lung by forming a lining layer between the aqueous airway liquid and the inspired air. The major component of surfactant, dipalmitoyl-phosphatidylcholine (DPPC), is an amphiphatic phospholipid. Its polar head region is associated with the aqueous hypophase lining the airways whereas the hydrophobic fatty acid chains face the luminal air. Surfactant-specific proteins facilitate the arrangement of phospholipids in the lining layer, thereby optimizing surface-tension-reducing capacity. This important function prevents alveolar and airway collapse at end-expiration and thus allows cyclic ventilation of the lungs. After the discovery of the basic functional principle of pulmonary surfactant more than 70 years ago, the pulmonary surfactant system has been intensively investigated and more than 9000 publications have revealed numerous aspects of surfactant synthesis, secretion, metabolism and various functions in the alveolar compartment. The pathogenetic relevance of surfactant was initially recognized in infant respiratory distress syndrome as a quantitative surfactant deficiency , but today biochemical and biophysical surfactant abnormalities are reported in various lung diseases, such as acute respiratory distress syndrome, pneumonia, and cardiogenic lung edema . The precise composition of surfactant in health and disease is known down to the genetic code of its specific proteins. While surfactant was initially thought to be a key player in the biophysical behavior of the lung, today its immunomodulatory properties make surfactant a fascinating compound in innate and adaptive immunity of the lung. Surfactant proteins act as a first-line defense against invading microorganisms. Moreover, they possess binding capacity for aeroallergens, highlighting the possible role of the pulmonary surfactant system in allergic diseases such as asthma. The possible involvement of pulmonary surfactant in the pathophysiology of respiratory diseases with a predominant disturbance in the conducting airways, such as asthma, has only recently been addressed . Asthma is characterized by chronic inflammation of the airways with eosinophils and T helper lymphocytes associated with bronchial hyper-responsiveness, which causes a reversible form of airway obstruction after inhalation of a variety of stimuli. Airway obstruction with increased airway resistance in asthma, which is commonly thought to be caused by smooth muscle constriction, mucosal edema and secretion of fluid into the airway lumen, may partly be due to a poor function of pulmonary surfactant. In the past decade, direct and indirect evidence has emerged for surfactant as a factor in the regulation of airway calibers and a modulator of allergic inflammation. The following sections review the potential role of surfactant in asthma. The majority of surfactant is synthesized and secreted by alveolar type II cells. During expiration, alveolar surfactant becomes extruded into the adjacent conducting airways. Electron microscopy has revealed that surfactant material forming monolayers and multilayers can be found at the air-liquid interface of the airway lumen. In addition, multi-lamellar vesicles and lattice-like tubular myelin can be found within the hypophase of the epithelial lining fluid covering the airways . Immunohistochemistry and in situ hybridization studies demonstrated that surfactant protein and mRNA expression are not restricted to alveolar type II cells. Whitsett and coworkers  have shown that during lung development, the hydrophobic surfactant protein (SP)-B and SP-C mRNAs are first expressed in bronchi and bronchioles. Expression in epithelial cells of the bronchiolo-alveolar portals and in type II cells increased with gestational age . In the fetal and adult human lung, SP-B and SP-C are expressed primarily in distal conducting and terminal airway epithelium . Surfactant-protein synthesis has been shown in Clara cells [6,7] and SP-A and SP-D were also found in more proximal parts of the respiratory tract [8,9,10]. In addition to the spatial distribution of surfactant proteins, local synthesis and release of phospholipids in tracheal epithelial cells have been demonstrated . Clara cells do not, however, secrete or synthesize lamellar bodies or DPPC. To conclude, local synthesis of surfactant components in the airways might indicate the possibility of adaptation and regulation of the airway surfactant system. Studying the composition of airway surfactant still has major limitations, as there is no method for selective sampling of surfactant from the conducting airways. It has been demonstrated that airway secretions from tracheal aspirates contain significant amounts of surfactant with a phospholipid composition similar to alveolar surfactant [12,13]. In contrast, the concentrations of surfactant proteins have been found to be decreased in tracheal aspirates from porcine lungs . In patients with asthma, the percentage of DPPC decreased in sputum but not in bronchoalveolar lavage fluid (BALF), while SP-A levels were found to be unchanged . Interestingly, the percentage of DPPC in sputum correlated to the lung function variable FEV1 (forced expiratory volume in 1 s). Van de Graaf et al. reported that BALF levels of SP-A were decreased in patients with asthma. Accordingly, it has been reported that mite-allergen-induced airway inflammation leads to decreased levels of SP-A and SP-D in BALF from sensitized mice . In contrast, Cheng and co-workers  found increased levels of SP-A and SP-D in bronchial and alveolar lavages in mild, stable asthmatics compared with controls. The discrepancy of these findings might be due to different time points and methods of sampling of the lavage fluids, and requires further clarification. Airway surfactant reduces surface tension at the air-liquid interface of conducting airways. This decreases the tendency of airway liquid to form bridges in the more narrow airway lumen (film collapse). In addition, a low surface tension minimizes the amount of negative pressure in the airway wall and its adjacent liquid layer, which in turn decreases the tendency for airway wall ('compliant') collapse. According to the law of LaPlace that applies to cylinders (P= γ/r, where p is transmural pressure, γ is surface tension, and r is airway radius), it becomes obvious that the smaller the airways become, the higher the pressure would rise if surface-active material lowering the value of γ were absent. Surface tension in the conducting airways has been shown to be in the range 25–30 mN/m [12,17]. This causes transmural pressures of less than 1 cmH2O whereby the patency of airways is maintained. By preventing both film collapse and compliant collapse, airway surfactant secures airway architecture and its openness. A simple method to estimate surfactant function, as it applies to the cylindrical surface of a narrow conducting airway, is the capillary surfactometer. This instrument simulates the morphology and function of a terminal conducting airway with a glass capillary that in a short section is particularly narrow with an inner diameter of 0.2 mm [18,19,20]. It utilizes a very small volume (0.5 μl) of surfactant. By raising the pressure, the liquid is extruded from the narrow section. Pressure is zero if the capillary is open for free airflow, but there is an increase in pressure when the liquid returns to block the narrow section. Well functioning pulmonary surfactant will keep the capillary open 100%, showing an excellent ability to maintain airway patency, whereas when surfactant functions very poorly, the value of 'open in %' will be zero. Liu et al. found that surfactant-containing fluid allowed a free airflow through the tube whereas saline led to spontaneous refilling of the capillary. The ability of surfactant to maintain free airflow was lost with the addition of albumin or fibrinogen (two potent surfactant inhibitors). In a recent study, we demonstrated that surfactant dysfunction by proteins was further disturbed by cooling . This may explain the finding of increased airway resistance in patients with exercise-induced asthma where airway surfactant with sufficient surface activity becomes seriously inactivated due to cooling during exercise with hyperventilation of cold air. The principal findings of surfactant function and dysfunction in the rigid airway model using the capillary surfactometer have been confirmed using an elegant approach to study conducting airway function in excised isolated rat lungs . Surfactant also contributes to the regulation of airway fluid balance, improves bronchial clearance and sets up a barrier to inhaled agents. Firstly, the high surface pressure (low surface tension) of surfactant counteracts fluid influx into the airway lumen. Loss of surface activity would result in additional inward forces that cause fluid accumulation in the airway lumen. The influence of surfactant on airway liquid balance also includes prevention of desiccation. Secondly, surfactant improves bronchial clearance by optimizing transport of particles and bacteria from the peripheral to the more central airways. Moreover, surfactant has been shown to enhance mucociliary clearance , partly by increasing ciliary beat frequency . Thirdly, several studies have suggested that surfactant sets up a barrier to the diffusion of inhaled agents, including bacteria, allergens and drugs [25,26]. For example, depletion of the surfactant layer by lung lavage leads to augmented responses to drugs and allergens [27,28]. Interestingly, exogenous surfactant treatment lessens the airway response to inhaled, but not systemically given, bronchoconstrictor stimuli in rats, suggesting an airway barrier to drug diffusion . In addition, it has recently been shown that treatment of rats with exogenous phospholipids suppresses the neural activity of bronchial irritant receptors . This may support the view of a possible link between airway hyper-responsiveness and airway surfactant balance. Besides the important biophysical properties of pulmonary surfactant, its role in immunomodulation has attracted increasing interest in asthma. The hydrophilic surfactant proteins SP-A and SP-D are important components of the innate immune response. They are members of the collectins, a family of oligomeric molecules containing a collagen-like domain and a calcium-dependent lectin domain, known as a carbohydrate recognition domain. The ability of lung collectins to regulate immune cells has been shown to be affected by the presence of lipids . In asthma, the important immune cells in the allergic inflammatory response are dendritic cells, T-helper lymphocytes, IgE-producing B lymphocytes (plasma cells), mast cells and eosinophils. Of course, airway inflammation in asthma is a more complex scenario that also includes epithelial cells, smooth muscle cells and parenchymal cells; however, available data on the effect of surfactant components on these cells are rare. Of the various aspects of modulation of immune cell functions by surfactant components, the important findings relevant to asthma are summarized in the following section and illustrated in Fig. 1. Interaction of surfactant with airway inflammation in asthma. After uptake through the airway surfactant barrier (right side of figure), allergens are presented by dendritic cells (DC) to T cells (T) that release IL-2, proliferate, and differentiate into T helper 2 lymphocytes (Th2). These Th2 cells release cytokines (IL-4 and IL-5) that attract eosinophils (Eos) and stimulate IgE production by differentiated B lymphocytes (B). IgE is bound to mast cells (MC) that, upon stimulation with allergen, release mediators (such as histamine) inducing acute asthma attacks. Activated eosinophils degranulate and release toxic mediators like eosinophil cationic protein (ECP), leukotrienes (LT), and transforming growth factor-β (TGF-β) that induce epithelial damage and chronic airway inflammation. ECP is shown in bold because ECP, but not LT or TGF-β, has been shown to cause surfactant dysfunction (unpublished data). The various effects of surfactant proteins SP-A, SP-B, SP-C and SP-D are indicated. SP-A and SP-D are shown in bold to emphasize the importance of these surfactant molecules as immunomodulators in asthma. Mechanisms of stimulation, activation, induction, or release are symbolized by arrows whereas inhibition, decrease, or down-regulation are symbolized by lines terminated by =. ? is used to indicate that the effects of SP-A/SP-D are presently unclear. PL = phospholipid. A very early step in the induction of allergic inflammation is allergen uptake by dendritic cells, antigen processing and subsequent antigen presentation to T lymphocytes. SP-A has been shown to bind to pollen grains . In addition, it has been demonstrated that both SP-A and SP-D interact with mite allergens in a carbohydrate-specific and calcium-dependent manner . Moreover, SPA and SP-D were found to inhibit allergen-specific IgE binding to the mite allergens. These data may suggest that lung collectins inhibit the induction of allergic reactions by direct allergen binding. This in turn would be beneficial in preventing acute asthma attacks by inhibition of the allergen-specific IgE binding and possibly also by inhibition of allergen processing by dendritic cells. However, further research is required to answer questions on possible interactions of dendritic cells with surfactant components. T lymphocyte proliferation and cytokine release is an important step in the further activation of the adaptive immune system in asthma. This T-cell response can induce B lymphocyte differentiation into specific IgE antibody secreting plasma cells. In addition, interleukin (IL)-5 release by T lymphocytes attracts and activates eosinophils and prolongs eosinophil survival. Lymphocyte activity and proliferation can be downregulated by surfactant phospholipids and by the lung collectins SP-A and SP-D [34,35,36,37]. Both SP-A and SP-D inhibited production and release of IL-2 [36,37]. Importantly, it has recently been demonstrated that SP-A and SP-D inhibit allergen-induced proliferation of lymphocytes and histamine release from whole blood in response to the house dust mite allergen Dermatophagoides pteronyssinus in a dose-dependent manner [33,38]. These data suggest that lung collectins may be important molecules in asthma pathogenesis, both during the acute asthma attack characterized by histamine release and in the chronic airway inflammation by modulating lymphocyte proliferation. Eosinophils play an important role in chronic airway inflammation in asthma. It has been shown by Cheng and coworkers  that SP-A suppresses the production and release of IL-8 by eosinophils stimulated by ionomycin. The SP-A effect was concentration dependent and reversed by addition of an anti-SP-A antibody. We recently demonstrated that the IL-5 stimulated expression of activation markers CD69 and HLA-DR on eosinophils was reduced in the presence of natural bovine lipid extract surfactant in a concentration-dependent fashion . This effect was presumably mediated by the lipid fraction of the surfactant preparation and definitely not mediated by SPA, as the lipid-extracted surfactant contained no hydrophilic surfactant proteins. One report states that zymosan-activated eosinophils stimulate phosphatidylcholine secretion in cultured type II pneumocytes . These findings may suggest a feedback-loop between surfactant release and eosinophil activation. Much more research is required, however, to better understand the network between surfactant components and eosinophil activation and cytokine release. Surfactant changes in asthma have been investigated using animal models and hitherto only a few human studies. In a murine model of asthma, it has been reported that guinea pigs, sensitized with ovalbumin, and then challenged with aerosolized antigen, reacted with a leakage of plasma proteins into the airways, a markedly increased airway resistance and an altered surfactant performance, indicating a dysfunction . It has also been shown that prophylactic treatment of sensitized animals with intratracheal instillation of surfactant reduces the deteriorating lung function that would otherwise have developed . In studies at another laboratory, it was demonstrated that treatment of immunized guinea pigs with aerosolized surfactant alleviates an increase in airway resistance . In the past few years, data from patients with asthma have accumulated, but are still rare. Kurashima et al. reported that sputum samples from patients with asthma have a low surface activity. We have recently investigated the inflammatory changes of BALF and the performance of BALF surfactant in healthy controls and patients with mild allergic asthma, before and after segmental allergen challenge . Allergen challenge of asthmatics, but not of healthy volunteers, significantly increased eosinophils, proteins, the ratio of small to large surfactant aggregates (SA/LA), and decreased surface activity measured with the pulsating bubble surfactometer and the capillary surfactometer . Analysis of phospholipid molecular species from BALF and plasma suggested that changes in phosphatidylcholine composition in BALF in asthmatic subjects after allergen challenge was due to infiltration of plasma lipoproteins, but not to phospholipid catabolism . Thus, the most likely reason for disturbed surfactant function was that proteins had invaded the airways as they reached a 10-fold increase in concentration. Proteins have extensively been proven to inhibit surfactant function [48,49]. Interestingly, a washing procedure with saline that removed water-soluble inhibitors, such as the proteins, restored surfactant function. There is a wide variety of lung structure and function among vertebrates. Surfactant lipids and specific proteins line the internal surface of the lung of all vertebrates. While mammalian surfactant needs to provide low surface tensions for alveolar stability and a reduction in the work of breathing, surfactant in non-mammals has a more primitive function with lower surface activity because larger respiratory units are more compliant and the risk of end-expiratory collapse is far less. Here, surfactant appears to act as an anti-glue that prevents surface adhesion in the case of lung collapse, for example, during diving . In contrast to the saccular or alveolar structure of those lungs, the respiratory tract of birds has a completely different structure. Birds have tubular lungs that do not contain alveoli. Avian surfactant should, therefore, function predominantly to maintain airflow through the lung tubules rather than preventing alveolar collapse. From that, an interesting approach to studying airway surfactant function and composition arises that could further elucidate the role of surfactant in the airways. This is all the more important as it has been impossible so far to selectively sample airway surfactant from mammalian lungs without substantial contamination from the alveoli. Consequently, we have recently investigated functional, structural and biochemical parameters of avian surfactant. While a uniform surfactant layer within the air tubules was demonstrable by electron microscopy, tubular myelin was absent in avian surfactant preparations. Although dynamic surface properties were impaired in bird surfactant, the ability to keep capillaries open was as good as with mammalian surfactant . Compared to mammalian surfactant, bird surfactant from duck and chicken was enriched in DPPC, but contained less palmitoylmyristoyl-phosphatidylcholine (PC16:0/14:0) and palmitoylpamitoleoyl-phosphatidylcholine (PC16:0/16:1). For these last two phosphatidylcholine species, no defined role in mammalian surfactant has been established, but it has been shown that their concentrations increase during fetal development . This might indicate a specific function within the alveolus, such as promoting adsorption of DPPC, which could serve to open, or re-open, collapsed alveoli. While SP-B was detectable in avian surfactant, both SP-A and SP-C were absent. SP-B promotes film formation at the air-liquid interface . Consequently, its presence in bird surfactant is consistent with good adsorption function demonstrated by studies with the pulsating bubble surfactometer and the capillary surfactometer. The importance of SP-B for airway surfactant function is further supported by the finding that heterozygous SP-B-deficient mice have higher residual volumes than wild-type mice, a common pulmonary function abnormality in obstructive airway disease . An interesting observation was that although avian surfactant showed impaired functional properties under dynamic cycling conditions with the pulsating bubble surfactometer, it was sufficient to keep open tubules as studied with the capillary surfactometer . These data suggest that airway surfactant does not require all the components found in alveolar surfactant preparations to achieve optimal function in the airway compartment. This might explain why local differences in the airways with regard to surfactant protein expression do not necessarily account for dysfunctioning surfactant according to the needs of the airway compartment. From an evolutionary standpoint, it might have been more important to express the hydrophilic surfactant proteins SP-A and SP-D to optimize for allergen binding and innate immunity in the airways rather than perfect surface properties. An increasing body of evidence from studies with surfactant protein deficient animals indicates that alterations in the level of surfactant proteins contribute to the pathogenesis of a variety of lung diseases. Experiments with mice deficient in the lung collectins SP-A and SP-D suggest that altered levels or activities of the lung collectins in vivo are associated with an increased risk of lung infections . Although both surfactant proteins have been shown to bind allergens or to modify the production and release of inflammatory mediators by allergic effector cells in vitro, in vivo data in SP-A or SP-D-deficient mice to rule out their role in allergic inflammation are missing to date. While SP-A-deficient mice have no apparent abnormalities in lung function , SP-D-deficient animals suffer from enlargement of terminal airways and emphysema . Signs of obstructive airway disease in SP-D knock-out mice, however, probably reflect the result of an imbal-anced chronic lung inflammation with pathological airway remodeling rather than an impact of a lack of SP-D on biophysical surfactant function in the airways. Hydrophobic SP-B and SP-C are very important for the biophysical surfactant properties. With regard to in vivo lung function, SP-B is the most important surfactant protein. Infants bearing mutations of the SP-B gene that lead to an absence of SP-B and gene-targeted mice lacking SP-B die from respiratory failure after birth [58,59]. In heterozygous SP-B-deficient mice (which have a 50% decrease in SP-B mRNA and SP-B protein compared to wild type), lung compliance decreases and residual volumes increase . The latter finding suggests air trapping, indicating that airway obstruction might have been due to a surfactant dysfunction caused by the SP-B deficiency. An interesting finding results from mice overexpressing IL-4 in the airways under the control of the Clara cell secretory protein promoter. While total SP-A and SP-B levels in bronchoalveolar fluids and lung homogenates were increased, surfactant protein B positive cells were decreased in bronchial and bronchiolar epithelial cells, but staining was unchanged in alveolar type II cells . It might be speculated that in asthma, the allergic inflammation with increased amounts of IL-4 in the airway environment leads to diminished local SP-B levels that can account for airway obstruction as seen in heterozygous SP-B-deficient mice. In contrast to the unequivocal relevance of SP-B for in vivo lung function, SP-C-deficient mice develop normally and they do not show alterations in the histopathology of airways or alveoli . Impaired pulmonary function showing decreased hysteresivity without significant changes in airway and tissue resistance, however, suggests that SP-C may stabilize alveolar surfactant films at low lung volumes. In a murine asthma model, it has recently been demonstrated that allergen-induced airway inflammation is associated with downregulation of SP-C, whereas SP-A and SP-D are upregulated . The down-regulation of the human SP-C promoter in this animal model was found to be IL-5 dependent, highlighting a potential role for eosinophilic inflammation as eosinophils produce and respond to IL-5. SP-C levels in patients with asthma need to be determined. Although there is no direct proof that surfactant dysfunction in human asthma causes airway obstruction, the above-mentioned and published data from the literature support the concept that poor functioning surfactant contributes to the pathophysiological scenario in asthma. Thus, it seems justified to investigate the potential role of surfactant therapy in asthma. There are two different ways to improve the surfactant balance in the airways. Firstly, various drugs that are commonly used in asthma therapy, like corticosteroids, β-adrenergic agents and theophylline have been shown to stimulate surfactant synthesis or secretion [63,64,65]. It remains to be determined, however, whether pharmacological stimuli can augment surfactant secretion to an extent that could be clinically relevant. Secondly, treatment with exogenous surfactant has been shown to improve allergic airway obstruction in animal models of asthma [43,44]. Human data are rare; a small randomized controlled trial demonstrated a significant improvement in pulmonary function data after inhalation of surfactant in patients with acute asthma attacks . In contrast, nebulized surfactant did not alter airway obstruction and bronchial responsiveness to histamine in asthmatic children with mild airflow limitation . A prospective randomized controlled trial of aerosolized synthetic surfactant (Exosurf) in 87 adult patients with stable chronic bronchitis revealed a significant improvement of 11% in forced expiratory volume in 1 s, a 6% decrease in thoracic gas trapping, and an improvement of sputum transportability . Recently, it has been reported that exogenous surfactant improved disease course in infants with respiratory syncytial virus bronchiolitis , an obstructive airway disease for which a surfactant dysfunction has been demonstrated . Altogether, these results demonstrate that exogenous surfactant therapy might have at least some beneficial effect in patients with asthma and obstructive airway disease. Exogenous surfactant therapy is expensive, however, and thus still limited to research and case studies. Future investigations will help to unravel relevant surfactant components with the best anti-obstructive effects and the most potent anti-inflammatory capacity. Pulmonary surfactant with an optimal function in the airways is important because it stabilizes the conducting airways, prevents fluid accumulation within the airway lumen, improves bronchial clearance, acts as a barrier against the uptake of inhaled agents and has important immunomodulatory properties. In asthma, it has been demonstrated that there is a surfactant dysfunction mainly due to inhibition by proteins that enter the airways during the inflammatory process. Surfactant dysfunction in asthma adds to our understanding of the pathophysiological scenario of airway obstruction in this respiratory disease. Therapeutic interventions that improve airway surfactant balance by stimulating the endogenous surfactant system or by exogenous surfactant supplementation might be of potential benefit in reversing airway obstruction and in modulating the allergic inflammation in asthma. To succeed in finding safe and effective ways of manipulating airway inflammation and airway obstruction by surfactant components may prove helpful in asthma.